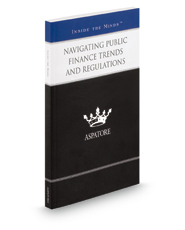 Navigating Public Finance Trends and Regulations provides an authoritative, insider's perspective on public-private partnerships in the wake of the economic recession. This book is written by experienced partners from law firms across the nation who outline the key elements of successful local governments and explore the impact of SEC scrutiny on public finance participants. These top lawyers offer advice on diversifying counsel in public financing, surpassing obstacles in funding projects, and helping clients structure partnerships. Covering a range of topics from utilizing shared local government goals of providing public services to educating clients on post-issuance practices, these experts stress the importance of overcoming challenges in capturing private capital for public services and discuss key strategies for complying with IRS tax requirements. The different niches represented and the breadth of perspectives presented enable readers to get inside some of the great legal minds of today, as these experienced lawyers offer up their thoughts on the keys to success within this evolving legal field.